Forgotten Hollywood » Blog Archive » “Forgotten Hollywood”- Kirk Douglas / Marvin Hamlisch News! « “Forgotten Hollywood”- Universal Horror on Tap in October! “Forgotten Hollywood”- Kirk Douglas / Marvin Hamlisch News! 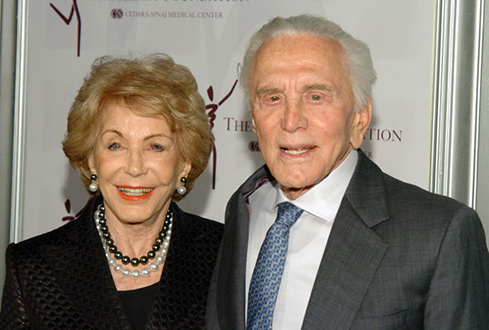 Kirk and Anne Douglas has doubled their Los Angeles Skid Row pledge for homeless women to $10 million. Named to honor his wife, the Anne Douglas Center for Women at the Los Angeles Mission opened two decades ago on Valentine’s Day. The Anne Douglas Center provides a year-long rehabilitation program for homeless and otherwise destitute women. Rehabilitation is followed by a transition program that gives the women the support they need to return to life outside the Mission. The Juilliard School plans a star-filled private musical tribute to Marvin Hamlisch, headlined by Barbra Streisand, Aretha Franklin and Liza Minnelli. Also slated to perform include Itzhak Perlman, Michael Feinstein, former stars of A Chorus Line, and the current cast of The Nutty Professor. The composer became the youngest person accepted by Juilliard. At the time, Marvin was seven years of age. His wife of 26 years, Terre, is expected to open the evening. This entry was posted on Friday, September 14th, 2012 at 12:05 am	and is filed under Blog by Manny Pacheco. You can follow any comments to this post through the RSS 2.0 feed. Responses are currently closed, but you can trackback from your own site.